Enjoy a perusable collection of 11 solo piano works-- composed over a span of roughly 20 years. Click on any title for additional information about the piece. Upon placing an order for the collection, a fresh link that includes all of the pdf score downloads, along with an access username and password, will be emailed to you. During two multi-day sessions in January and June 2018, pianist and Yamaha Artist Adam Marks recorded all of Alex Shapiro's solo piano works composed to date, for an album slated to be released in early 2019. 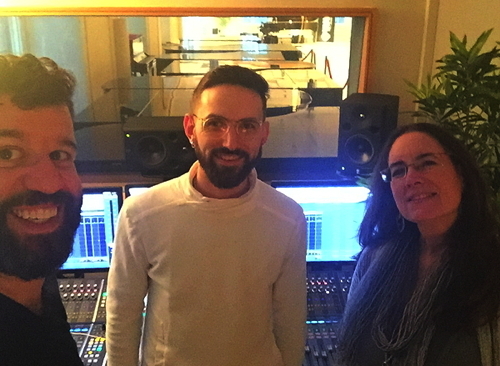 Yamaha Artist Services in New York City generously contributed the use of their studio helmed by engineer Aaron David Ross, and gave Adam access to the spectacular 9' Yamaha DCFX. The collaboration has been a joy in every regard. The instrument is astonishing in its combination of power and gentle response, and will be transported to a physical hall in November 2018 where it will be mic'ed in an acoustically oriented venue for this final stage of the recording. 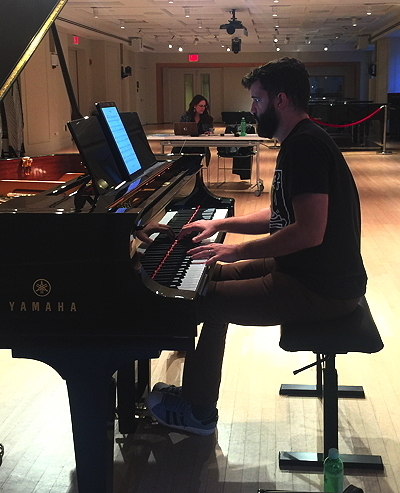 The digital files recorded and edited earlier in the year will come to life once again-- this time, with Adam sitting next to Alex, yards away from the piano that's playing back his beautiful performances! CLICK to watch a moment of the DCFX magic! keys and pedals of the 9' Yamaha DCFX. on the other side of the glass! Perusal scores are available; send a request in an email by clicking HERE. Audio excerpts of mov'ts 1, 2, 3 and 5 performed by Hamilton Tescarollo. Audio excerpt of mov't 4 performed by Susanne Kessel. Score available for $18.00 print, and $9 digital, from Activist Music. Piano Suite No. 1: The Resonance of Childhood was composed as a set of personal reflections exploring early years, difficult parental relationships and ultimately the acceptance of conflicting emotions. The opening set of variations sets the tone for the entire Suite: searching and hope that are met with the uncomfortable combination of disappointment and acquiescence. Of the five short movements, perhaps the most intimate is the fourth, entitled For My Father, which was written in response to a beloved parent's descent into dementia. Audio excerpt performed by Susanne Kessel. Score available for $12.00 print, and $6 digital, from Activist Music. Of the five short movements that comprise Piano Suite No. 1: The Resonance of Childhood, perhaps the most intimate is the fourth, entitled For My Father, which was written in response to a beloved parent's descent into dementia. As some notes fall downward and others struggle against that decline, the music reflects the composer's experience of watching a brilliant parent’s irreversible descent. Echoing the personal journey of witnessing her father’s essence evaporate over seven years, this elegiac piece ends with the quiet, resolute acceptance of loss. 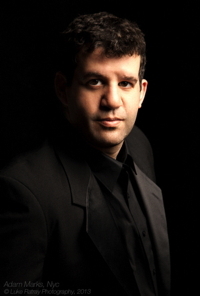 Audio excerpt performed by Alex Shapiro. Score available for $15.00 print, $8 digital, from Activist Music. I've spent the great majority of my life living at the water's edge: 21 years on the rivers that embrace Manhattan, 24 on the shore of Pacific-kissed Malibu, and now over a decade, perched on a rock above the lusty Salish Sea that swirls around Washington states's San Juan Island. Many of my pieces reflect this aquatic proximity, from intimate chamber works to grand-scale electroacoustic symphonic ones, and through these pieces I'm able to share my awe with listeners. This Intermezzo was written in 1998 as a response to the waves of the ocean at my toes, as well as a reflection of the waves of a more introspective, emotional sea. A long and lyrical theme floats above a steady ostinato, perhaps as a lengthy branch of kelp might dance from the force of each coming tide. It's these hypnotic rhythms that lull my muses, and inspire my senses— and perhaps yours. Dramatic, lyrical, and humorous; the brief, final movement, "Scherzo," also makes a fine encore piece. Audio excerpts of movements 1 and 2 performed by Teresa McCollough. Audio excerpt of movement 3 performed by Beatrix Klein. Score available for $22.00 print, $11 digital, from Activist Music. Sonata for Piano is a three movement work written in the structural tradition of many classical sonatas. Throughout the piece, there's an emphasis on strong melodies and rhythms and a lush use of the keyboard. The first movement, Moderato, explores two themes that are first developed independently and ultimately are interwoven as two parts of a whole. A set of jazz harmonies are implied against more angular melodic lines. The second movement, Lento; Andante, takes the listener on an emotional, dreamlike journey that leads to a passionate outburst, and the final movement, Scherzo, is just that an impish romp through bitonality that ends with a laugh. Audio excerpts performed by Susanne Kessel. Score available for $12.00 print, $6 digital, from Activist Music. Slowly, searching is a modern day homage to the lyricism, melancholy and passion of Robert Schumann. German pianist Susanne Kessel created a project titled Kreisleriana 2010, asking eight composers to choose a movement of Schumann's beloved suite as inspiration for their own voice. I was touched by the fourth, Sehr Langsam, and chose a few notes from it as my point of departure, and later, development. Two hundred years since this great composer's birth, the themes of peacefulness, joy, madness and deep pain remain a human constant. Audio excerpts performed by Teresa McCollough. Spark was inspired by the life, love, energy and heart of Dale Mara Bershad, a gifted musician who often used her talents to share the joy of expression and wonder with young children. 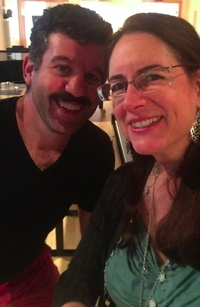 As a mother, teacher, and performer, Mara's remarkable inner light cast an indelible glow. Her essence remains radiant and present: a spark from a life filled with passion and delight, burning brightly, intensely, and without end. Editions Musica Ferrum in a beautiful 152 page volume, which includes the first 25 short pieces of the series. My friend, the superb pianist Susanne Kessel, shares something significant with one of our mutual muses, Ludwig van Beethoven: they both hail from Bonn, Germany. Eyeing the upcoming occasion of Beethoven's 250th birth year in 2020, Susanne devised a beautiful plan: to shepherd 250 short new pieces of music into the world in the composer's honor, from the hearts of artists who would happily consider themselves among his protégés. If only Beethoven could know the enduring power of his legacy. So what better way to compose an homage to this giant, than to ask the devoted pianist for whom I was writing the piece what some of her favorite Beethoven piano chords might be? I knew the answer to mine: the iconic, imposing, foreboding, C minor start to Sonata No. 8, Opus 13, the "Pathéthique." My teenage hands passionately played each phrase thousands of times, and while poor Ludwig might have been rolling over in his grave (there's a good reason I chose to compose rather than perform), the influence of his music in my life has been monumental. Susanne submitted several fine suggestions, which are found throughout my little offering. And thus Beethoven, Kessel, and Shapiro, have become bound for a brief and touching moment in this Chord History. Pensive, jaunty, dark, hopeful. The 6th movement, "Touch It," is a toccata that when played as fast as possible, also serves as a short encore piece. Audio excerpts performed by Alex Shapiro. Score available for $40 print, or $20 digital, from Activist Music. Score and audio track available for $45 print, or $25 digital, from Activist Music. Arcana Planet is the electroacoustic version of Arcana, and explores the painfully fragile and often perilous relationship between humans and the secrets of earth's abundant plant life. The music often does so from the perspective of the plants themselves, with healing herbs as protagonists of a story that begins with a dire warning, and ends with the faith that wisdom and grace shall ultimately triumph. I was very touched by Michael's ongoing love of this piece from the moment I delivered it to him, through countless hours of tireless practice, to ultimately, its happy premiere. I was doubly touched when immediately after the premiere, Michael reiterated his adoration of the music and inquired whether I might be able to add a soundscape to the existing piece, thus expanding its sonic realm. After considering the possibilities of new textures and sound worlds, I was delighted to embark on yet another iteration of the music and its meaning to me as I ponder the future of our Earth. Audio excerpts performed by Ana Cervantes. Score available for $12 print, or $6 digital, from Activist Music. "Wherever you look in Luvina, it's a very sad place. You're going there, so you'll find out. I would say it's the place where sadness nests... the breeze that blows there moves it around but never takes it away." Such is the bleak world described in Juan Rulfo's short story, Luvina. When pianist Ana Cervantes asked me to compose a piece in response to the late Mexican author's writing, I had not read any of his work and looked forward to the books that would soon appear in my mailbox. Sitting in my studio, immersed in the grim desert of dire poverty and hopelessness Rulfo describes in this and other equally moving writings, I cried. Long since finishing the music, my thoughts still return to a landscape that is unspeakably sad and, through Rulfo's words, a place where slow and insistent burdens are met with simple, unquestioning acceptance. Haungtingly lyrical and at times, frightening. Score and audio track available for $25.00 print, or $15 digital, from Activist Music. "Wherever you look in Luvina, it's a very sad place. You're going there, so you'll find out. I would say it's the place where sadness nests... the breeze that blows there moves it around but never takes it away." Such is the bleak world described in the late Mexican author Juan Rulfo's short story, "Luvina," about villagers living in a grim desert of dire poverty and hopelessness. Absorb the haunting lilt of Rulfo's own voice, reading passages from "Luvina" as the music transports us to a place where slow and insistent burdens are met with simple, unquestioning acceptance. The doleful song of Juan Rulfo's ragged voice moved me so much, that shortly after I composed the original version of this piece for solo piano, Luvina, I chose to create an additional version of the piece that included excerpts of his reading, along with a pointed electronic soundscape that would bring Rulfo's grim descriptions further to life. The oppressive gusts of the endless wind are reflected in the title, Vendaval de Luvina. Below are commercially released recordings of several of the above pieces. Click on any disc for more info. For My Father, from Piano Suite No. 1, is featured on Susanne Kessel's 2006 CD, Californian Concert, on Oehms Classics OC 534. For My Father, from Piano Suite No. 1, is featured on the 2007 Innova Recordings CD, Notes from the Kelp (innova 683). Luvina is featured on pianist Ana Cervantes' CD, Solo Rumores (Quindecim Recordings 186). Slowly, searching is featured on Susanne Kessel's 2010 CD, An Robert Schumann, on Obst Records P330.30. Sonata for Piano is featured on Teresa McCollough's Innova Recordings CD, New American Piano Music (innova 552). A version of Intermezzo, for bass flute and harp, is featured on Jenni Olson's 2012 CD, The Dreams of Birds, on Delos Records DE3434. Chord History is featured on Susanne Kessel's 2016 CD, 250 Piano Pieces for Beethoven, Vol. 1, on Obst LC07384. Dr. Elizabeth Etnoyer has published her 2015 doctoral dissertation, The Keyboard Works of Alex Shapiro. To read the synopsis and order a pdf or hard copy of the book, please click here. 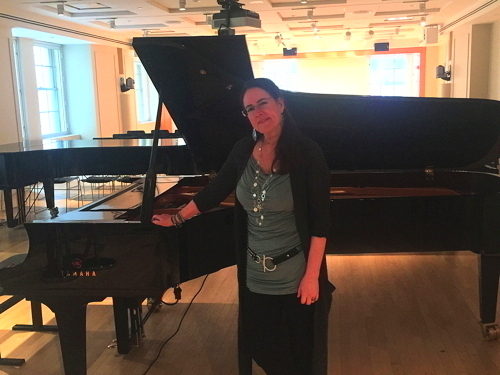 at Yamaha Artist Services in NYC, June 2018.